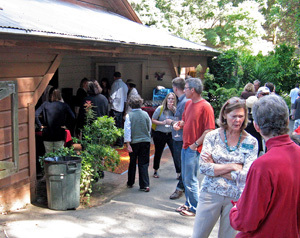 Report on the 8th annual wine tasting presented by the Marin County Winegrowers Association, on Saturday, June 23rd, 2012, at the historic Escalle Winery in Larkspur, California. 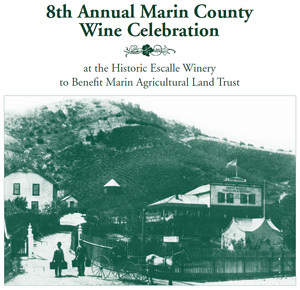 The event is a benefit for the Marin Agricultural Land Trust and DG Educational Services, and focuses on wines from the Marin County AVA. The Marin County Winegrowers Association promotes wines from the county, and supports cooperation among growers and wineries. It helps to raise awareness of Marin’s wine history as well as of its current wineries and wines. The Marin Agricultural Land Trust (MALT) is a non-profit organization formed in 1980 by local ranchers and environmentalists, dedicated to preserving Marin farmlands for agricultural use. MALT works with landowners to acquire agricultural easements to prevent the spread of non-agricultural development on the area’s farmlands. MALT also works to support public policy that preserves agriculture in Marin. MALT conservation easements now total over 40,000 acres, on over 65 family farms and ranches, and this farmland produces some of the Bay Area’s best-known organic produce, dairy products, and wines. The annual Marin wine tasting, organized by Mark Pasternak of Devil’s Gulch Ranch, is a unique opportunity to try so many wines sourced from Marin County vineyards. The wineries themselves were from a number of places, not just located in Marin, while the vineyards are in various parts of the county. Up until last year, these tastings have been solely for Marin Pinot Noir, but now all wines from Marin are welcome at the event. While the wines remain predominantly Pinots, other wines being poured included Chardonnay, Riesling, and Cabernet Sauvignon, plus Pinot Noir Rosé and sparkling wines. 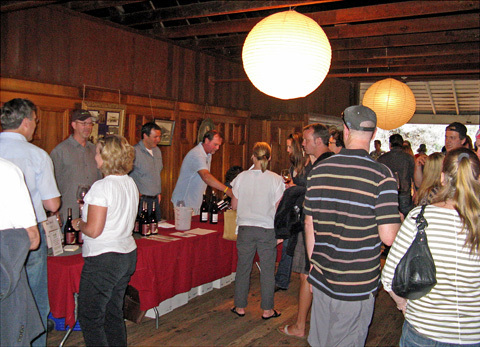 A total of 14 wineries poured at this year’s tasting, held on the upper level of the old Escalle Winery building. It was built by Frenchman Jean Escalle in the late 19th Century, and once had 23 acres of vineyards on the adjacent hillside. Sadly, the winery did not survive Prohibition. The space features photos of historic Larkspur on many of the beautifully-carved wood paneled walls. The old winery building continues to be a fine venue for this event. Although the space can become uncomfortably warm when the weather is hot, the day of this year’s event was fairly cool, and it was quite pleasant inside the room. The attendance looked like it was up from last year, but even with the larger crowd, the layout of the winery tables allowed plenty of space to circulate. The tables themselves were generously-sized, so there was not much problem with tasters crowding in front of them. Many wineries pour at the same spots in the room every year, so it was easy to find everyone. It seems like this event has run more smoothly each year I’ve attended, and this year was without any noticeable issues at all. As I’ve found every year at this event, the food was delicious and was all provided by artisan food purveyors from Marin County, including Dehasa foods, Point Reyes Vineyard Inn, Il Fornaio Bakery, Nicasio Valley Cheese, Point Reyes Farmstead Cheese, and Cowgirl Creamery. A pâté de lapin with pistachios and thyme was very tasty, as were the various grilled sausages that were passed around the room during the tasting. 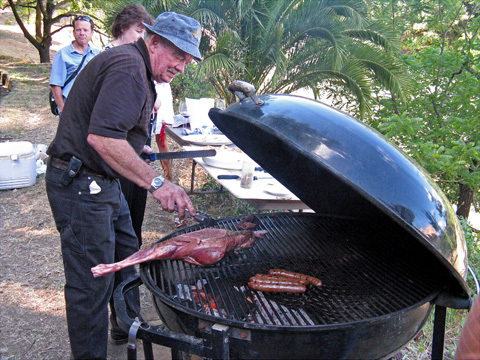 As I was leaving, I spotted more sausages along with a venison leg on the grill – too bad I didn’t have time to stay and try that! Grape-Nutz colleague Al Osterheld and I made the rounds of the winery tables, and I believe we tasted all of the wines being poured. Although I did not notice it at the time, I realized when I checked my notes later that there were many more repeat wines being poured this year than has been the case in the past. In fact, around 50% of the wines were vintages that I had tasted before at the Marin County Wine Celebration, although a handful of these were wines that had been barrel samples or pre-release peeks before. I’m not sure of the reason for this, but as there were quite a few 2009 “re-runs” and not that many 2010s being poured, I wonder whether the 2010s were felt to be not quite ready to show yet, or whether it was a case of not that many 2010s having been made. That year was a difficult vintage in Marin, with an unusually cool summer punctuated by a brief but nasty late-August heat spike. But if the number of repeat wines at the tasting was a bit disappointing, the good news was that I felt the overall quality of the wines this year was noticeably higher than in the past. I felt like many of those 2009 wines were helped by that extra year in the bottle, and there were other positive signs that I took away from this tasting as well. In general, the winemaking seemed stronger this year, with more vintners getting the best from their grapes. Some of the newer producers, such as Bailiwick, Couloir, and Easkoot, continued to impress this year, while some others, including Burning Bench and Pacheco Ranch, poured new releases that I thought were big steps up. Meanwhile, past favorites like DeLoach, Dutton-Goldfield, Kendric, and Pey-Marin were solid as usual. Vision Cellars – who make one of the best-known wines from Marin – did not pour this year. I want to add a short note on a particular vineyard that has gone under a couple of different names in the past. Known alternately as Corda Vineyard and Chileno Valley Vineyard, depending on the producer, it now seems to be called Chileno Valley by everyone I ran across. As it is still most likely the largest vineyard in Marin County and sells fruit to quite a few wineries, referring to it more consistently as Chileno Valley Vineyard should help to avoid potential confusion in the future. Although I did not include any barrel samples or library wines in the list of Favorites, I should note that barrel samples from Bailiwick and Kendric were very promising. And Point Reyes Vineyard generously poured some older Cabernets from their Quail Hill Vineyard near Terra Linda, in the San Rafael area. Their 1987 Cab in particular was an eye-opener, certainly the best Marin Cabernet I’ve tasted and one that could stand up to those from many better-known Cab producers. Overall, I felt that this was the best Marin County Wine Celebration that I have attended, with both established and newer producers raising the bar for wines made from Marin fruit. Marin Pinots in particular continue to lead the way – distinctive and attractive, generally in a lighter style than from most other areas in California. While still a tiny growing region, Marin shows the potential for greater things, and this event does a fine job of showcasing what the county’s grapes have to offer. Bailiwick 2009 “Borderline” Pinot Noir, Marin County. From mostly Swan, Pommard, and Dijon clones, about 44% new oak. Medium-light color, with aromas of black cherry, earth, herbs, and undertones of sweet oak. Medium weight on the palate with good structure and balance, this had a lively finish with refined tannins, nice. Bailiwick 2011 “Borderline” Pinot Noir, Marin County (barrel sample). From 667 clone from Chileno Valley and 777 from Kendric vineyards, about 20% whole cluster with a 28-day maceration. This will spend about 16 months in barrel. Medium-light garnet, this had some pretty floral notes on the nose with lots of upfront black cherry and plum fruit and some spice. Somewhat more structured and tannic at this stage than the 2009, this shows the potential to develop nicely. Comments: The fruit for both vintages was sourced from both Chileno Valley and Kendric Vineyards. The 2009 was the first release from brothers Bryan and Paul Vais, who also make several nice Pinots from other appellations. Their 2010 Marin Pinot will be released later this year. Burning Bench 2008 Pinot Noir, Moon Hill Vineyard, Marin County. Medium color, this displayed ripe black cherry, plus spice and vanilla/oak on the nose. On the bigger side for a Marin Pinot, this had a tangy finish with moderate tannins. Burning Bench 2009 Pinot Noir, Moon Hill Vineyard, Marin County. Medium ruby color, showing brighter red cherry fruit, spice, and touches of tea leaf and minerals. Not as weighty as the 2008, with a livelier mouthfeel and some tannic grip on the finish. A promising wine that should improve with a few years of bottle age, nice. Comments: The fruit from Moon Hill Vineyard, planted about ten years ago with 115, 667, 777, and 828 Pinot clones, formerly went into the bottlings from Brookside Cellars. The vineyard is located in the hills between San Geronimo and Nicasio. The 2009 bottling is easily the best I’ve tasted. Couloir 2010 Pinot Noir, Chileno Valley Vineyard, Marin County. About 33% whole-cluster fermentation, 25% new French oak. Medium color, with red fruits, earth, herbs, and some spice and vanilla/oak on the nose, plus just a hint of flowers. Medium-bodied with nice acidity and a lively finish with moderate tannins. The whole-cluster character is noticeable but should integrate over time, a nice wine that should only get better. Couloir 2010 Pinot Noir, Redding Ranch, Marin County. Mostly Dijon clones with a little Pommard, about 50% whole-cluster fermentation, aged in older French oak. Medium-light color, this showed the green/stemmy and earthy aromas upfront, with black cherry and spice playing supporting roles. Lighter on the palate than the Chileno Valley bottling, with much grippier tannins on the finish. An intriguing wine that will probably take years to unwind. Comments: Jon Grant’s Couloir wines have been impressive, and their fairly intense whole-cluster style sets them apart from most Marin Pinots. Redding Ranch is at about 1,400-foot elevation, overlooking the town of Nicasio – the tiny production of the 2010 Couloir bottling from this vineyard is already sold out. DeLoach 2009 Chardonnay, Stubbs Vineyard, Marin County. Aged in about 40% new French oak. This showed apply fruit along with toasty oak, vanilla, and spice. Medium-light weight in the mouth with a moderately creamy texture, it displayed lively acidity on the finish. DeLoach 2009 Pinot Noir, Stubbs Vineyard, Marin County. Medium-light garnet color, with strawberry and cranberry, spice, earth, and touches of black pepper and sweet oak. Medium-light bodied, this had good structure and moderate tannins, nice. DeLoach 2009 Pinot Noir, Marin County. Sourced mostly from Chileno Valley Vineyard. Medium-light color, displaying riper red fruit than the Stubbs bottling, this also showed bigger spice and oak components, plus some herbal undertones. Richer on the palate than the previous wine, with a smoother texture and medium tannins on the finish. Comments: These DeLoach wines were made by Dan Goldfield. All were nice, but I felt the Stubbs Vineyard Pinot was the most distinctive of the three. Dutton-Goldfield 2011 Riesling, Chileno Valley Vineyard, Marin County. Light color, this had intense floral aromas along with ripe, upfront apple and stone fruit notes and a touch of spice. Moderately rich and smooth, it finished with a trace of sweetness. Dutton-Goldfield 2009 Pinot Noir, Devil’s Gulch Ranch, Marin County. Medium color, this was quite aromatic, with flowers, black cherry and plum fruit, spice, and vanilla/oak. Medium-bodied with a nice texture in the mouth and a lively finish with moderate tannins. A nice wine now that should improve with some time in the cellar. 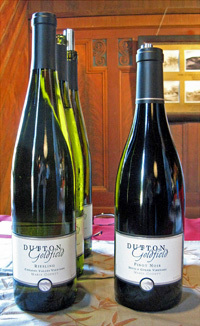 Comments: The 2011 was Dutton-Goldfield’s first Riesling from Chileno Valley Vineyard, and it was interesting to compare it with the Pey-Marin version. Foggy Bottom NV Pinot Noir, Marin County. From 115, 777, and a mystery clone! Medium-light color, with red cherry and cranberry fruit, fresh herbs, and a touch of earth. Medium-bodied with lively acidity, that had a clean and pleasant finish, good value for a lighter-style Pinot. Easkoot 2009 Pinot Noir, Marin County. About 10% whole-cluster fermentation. Medium color, this featured some floral notes on the nose, along with bright cherry and spice, and a touch of vanilla/oak. Bolder on the palate, with more structure and tannin on the finish. 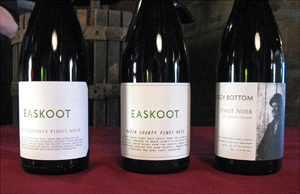 Easkoot 2010 Pinot Noir, Marin County. Medium color, displaying a more floral character, plus ripe cherry, tea leaf, and earth aromas. Brighter acidity in the mouth than the 2009, this also had more noticeable grip on the finish, but the overall balance was very good and this should age well – youthful but quite promising. Comments: The fruit is sourced from Chileno Valley Vineyard. The Foggy Bottom bottling is an entry-level Pinot that combines wine from both the 2009 and 2010 vintages. Easkoot owners Stephan Schindler and Emily Schindler Weissman also own Winemonger, an import business. (Disclosure – I helped bottle the 2009 Pinot). Kendric 2005 Pinot Noir, Marin County (unfiltered). Medium ruby color, this showed herbal notes and red fruits, with somewhat higher-toned character than what I recall from earlier tastings of this wine. Medium-bodied, a touch of spice and darker berry fruit came through in the mouth, and the finish was slightly tangy but had good length. Kendric 2008 Pinot Noir, Marin County. About 75% whole-cluster fermentation. Medium-light color, lighter than the 2005. This displayed more earth and spice on the nose, along with black cherry, minerals, and hints of flowers. A bit lighter weight than the 2005 and livelier on the palate, this had a clean, bright finish with refined tannins. The whole-cluster element is very well-integrated and this is a beautiful example of Marin Pinot that should age nicely. Kendric 2009 Pinot Noir, Marin County. About 65% whole-cluster fermentation. Bright garnet color, with raspberry and cherry fruit, tea leaf, earth, and touches of flowers and smoky oak. Showing more whole-cluster character than the 2008, with more structure and more grip on the finish. A young wine that will need more time to show its best. Kendric 2010 Pinot Noir, Marin County (barrel sample). Slightly darker color, featuring brighter aromas of red cherry and strawberry, herbs, and more baking spice than the 2009. Quite lively with fine acidity, this finished with moderate tannins. Another youngster that should settle down with some time in the cellar. Comments: Stewart Johnson once again poured his wines at this event. They’re all made from estate fruit from his vineyard on the northern edge of Marin, planted to seven clones of Pinot Noir. In recent vintages, Stewart has worked with more whole-cluster fermentations and longer macerations. Pacheco Ranch 2005 Cabernet Sauvignon, Estate, Marin County. Medium purple, fairly shy aromas of cassis and plum, with earth and black pepper notes. Lighter-bodied for a Cabernet, with plenty of acidity but not too tannic. Pacheco Ranch 2006 Cabernet Sauvignon, Estate, Marin County. Slightly darker color than the 2005, with more intense fruit, plus dried herbs, cinnamon, and more black pepper. More weight on the palate than the 2005, with a lively mouthfeel and moderate but refined tannins, a medium-bodied Cab that is nice right now but should continue to develop in the bottle. Pacheco Ranch 2006 Cabernet Sauvignon, “Reserve,” Estate, Marin County. The reserve wine is a vineyard selection from 40+ year-old vines, and is all free-run. More fruit-forward than the regular 2006 bottling, this also featured more spice, pepper, and vanilla/oak components. Medium-bodied with a bigger structure and a grippy finish. Comments: The oldest winery in Marin, started in 1973, Pacheco Ranch – located in the warmer eastern side of the county – specializes in estate-grown Cabernet Sauvignon. The wines are aged three years in barrel and another two in bottle before release. The Cabs are a bit rustic and in a lighter style than most from California – the current 2006 release showed particularly well. 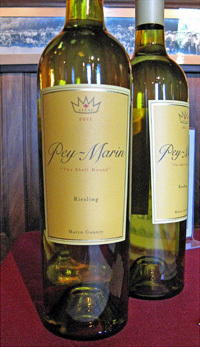 Pey-Marin 2011 “The Shell Mound” Riesling, Marin County. A dry Riesling made entirely in stainless steel with no malolactic fermentation. Very light straw color, featuring floral, pear, citrus, and lees aromas. Medium-bodied, this was viscous in the mouth but with a vibrant acidity and a dry, crisp finish, very nice. Pey-Marin 2009 “Trois Filles” Pinot Noir, Marin County. Medium-light color, this showed ripe cherry and spice, along with a touch of vanilla/oak. Medium weight on the palate and fairly lively, it finished with milder tannins. Comments: Pey-Marin’s Riesling continues to be outstanding year after year. 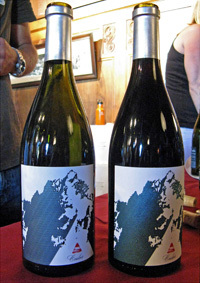 Their Marin Pinot is not always sourced from the same vineyards, and the 2009 fruit came from three West Marin locations, using eight Pinot clones. Point Reyes NV Blanc de Noir, Estate, Marin County. 100% Pinot Noir. Very light pink color, fairly fruit-forward apple and cherry notes along with spice and lees. Lighter-bodied, the acidity dominated on the finish. Point Reyes NV Blanc de Blanc, Estate, Marin County. Light yellow/straw color, this featured more yeasty aromas, plus citrus and stone fruit. Richer than the Blanc de Noir, this had a pleasant texture and more balance in the finish. Point Reyes 2007 Pinot Noir, Estate, Marin County. Medium-light color, showing higher-toned cherry, tea leaf, and spicy oak aromas. Lighter-bodied with a tangy finish. Point Reyes 2001 Cabernet Sauvignon, Quail Hill Vineyard, Marin County. Medium color, this featured herbal plum and cassis fruit along with some black pepper and earth notes. Somewhat thin in the mid-palate, it had only very mild tannins on the finish. Point Reyes 1997 Cabernet Sauvignon, Quail Hill Vineyard, Marin County. Displaying riper red fruits than the 2001, less herbal with more spice and a touch of oak. Medium-bodied, with more structure and tannin than the 2001. Quail Hill 1987 Cabernet Sauvignon, Quail Hill Vineyard, Marin County. Still maintaining good color, this had very pleasant cassis, herb, and black pepper aromatics along with a touch of baking spice. Medium weight in the mouth with nice balance and still some tannic bite on the finish, aging quite gracefully. Comments: Point Reyes’ estate Pinot vineyard is less than a mile from the shore of Tomales Bay, while their Quail Hill Vineyard near Terra Linda was planted in the 1960s. The Cabernets displayed good varietal character as well as their cooler-climate origins. The 1987 Cab was showing particularly well – quite a treat to taste it. Sean Thackrey 2009 “Andromeda” Pinot Noir, Devil’s Gulch Ranch, Marin County. From Dijon and Martini clones, about 25-30% new oak. Medium ruby color, featuring ripe red cherry and raspberry fruit, earth, spice, and a bit of sweet oak on the nose. Bolder on the palate than most of the Pinots at this tasting, but with nice acidity, this had a tangy finish with fairly mild tannins. Comments: Sean Thackrey and Dutton-Goldfield are the only wineries to make Pinot Noir from Mark Pasternak’s Devil’s Gulch Vineyard. Viandante del Cielo 2011 Pinot Noir Rosé, Skywalker Ranch, Marin County. From 100% estate-grown fruit, bottled in March. Light pink color, with fresh red berries, herbs, and a touch of spice. Fairly lively mouthfeel and a fresh finish – I thought this was a step up from the 2010 bottling. Viandante del Cielo 2009 Pinot Noir, Skywalker Ranch, Marin County. Medium color, with black cherry, baking spice, and sweet oak aromas. Medium-bodied, with moderate tannin on the finish. Skywalker 2009 Pinot Noir, Skywalker Ranch, Marin County. Medium-dark color, this displayed bolder aromatics of darker fruits, clove/spice, herbs, and a minerally note. More rich and full-bodied but with good balance and the structure for aging. Bigger in style than “typical” Marin Pinots but nice nonetheless. 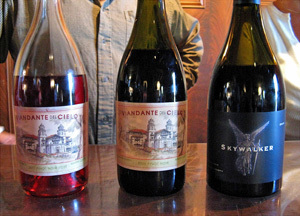 Comments: The Viandante del Cielo (essentially Skywalker in Italian) label is for the more basic wines from Skywalker Ranch, while the reserve wines are bottled under the Skywalker label. 26 acres of vineyard Chardonnay & Pinot Noir are planted, and annual production is around 1,000 cases. Both of the 2009 Pinots have picked up weight and complexity since I tasted them last year. 2007 Pinot Noir, Estate Grown, Marin County. Medium-light color, with earthy plum and black cherry fruit, and touches of baking spice and sweet oak. Medium-bodied and fairly smooth on the palate and on the finish. Comments: Mary Stubbs was on hand to pour her Pinot at the event. Stubbs Vineyard was planted in 1996 and is certified organic. 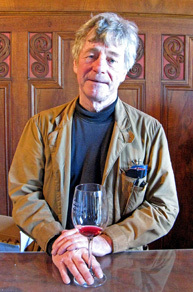 The Stubbs wines are made by Dan Goldfield. Willowbrook 2009 Pinot Noir, Chileno Valley Vineyard, Marin County. Medium-light garnet color, this featured tart red fruits, herbs, and lots of spicy oak on the nose. Medium weight in the mouth, with moderate acidity and mild tannins on the finish. Willowbrook 2008 Pinot Noir, Chileno Valley Vineyard, Marin County. Medium-light color, showing spicy black cherry, smoke, and vanilla/oak aromas. A bit brighter on the palate than the 2008, but with refined tannins. Comments: Willowbrook owner John Tracy also owns Owl Ridge Wine Services in Sebastopol, and the wines are made there.